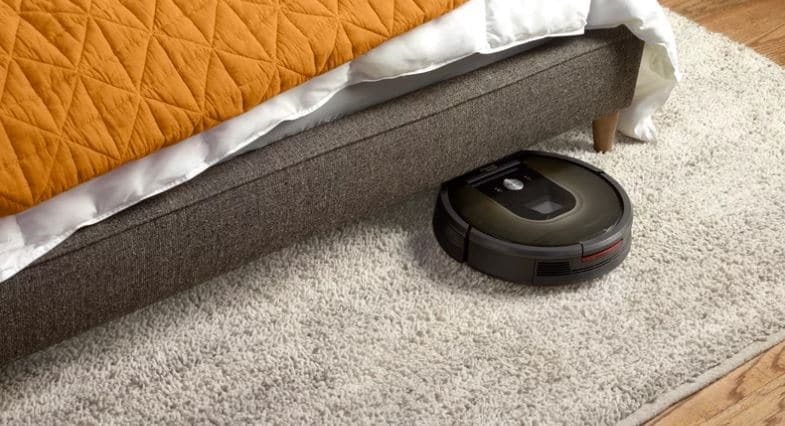 I love my Roomba. It’s an important member of this family and the only one that consistently picks stuff up off the floor. But one day my Roomba tried to murder me, and now things are weird. 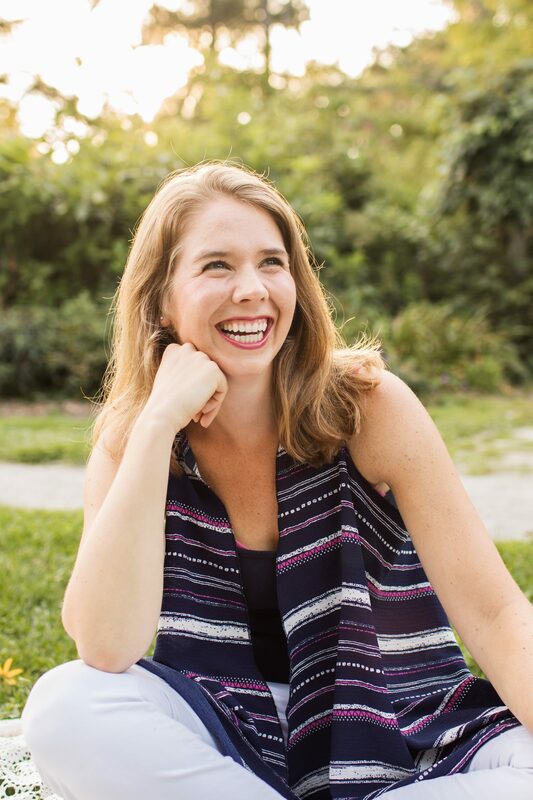 I work from home twice a week and usually drop the kids off at school and then rush home for a quick workout and an even quicker shower before logging on. Sometimes I even get ambitious and attempt to do a household chore before the clock strikes 9. Hit or miss on success. One day I was feeling the groove. Ellipitcal miles logged, a load of laundry in the washer, plenty of time for the shower – I am the QUEEN OF DOING ALL THE THINGS! I smugly turned on the Roomba to vacuum the bedrooms and upstairs hallway before hopping into the shower. My back hurt from the many self congratulatory pats I gave myself. I had accomplished so much, I didn’t even yell this morning. I wonder if the All-Time Best Parenting Awards are black tie or just semi formal? No bother, I’m sure I’ll have time to get to the dry cleaner. Halfway through the shower I heard a loud bang. No one else was home and the mice in the attic are usually much quieter than that, so it was strange. Then again, bang, bang, BANG. I poked my head out of the shower and saw the bathroom door wobble just slightly on it’s hinges. Oh dear Lord – this is it. A murderer has broken into my house and is trying to bang down this door! Never mind that it wasn’t locked. He probably assumed it was and is using his body weight! I jumped out of the shower and locked the door. Fortunately we have those little push button locks that could never been picked. It was like Alcatrez up in here. Except I was on the inside. And now a prisoner. So that simile didn’t work out as well as I’d hoped. Somehow I managed to finish my shower because if I was going to get murdered it seemed considerate to get the conditioner out of my hair first. Coroners have enough on their plate I would guess. The bags under my eyes alone will take them half a day so freshly washed hair would be helpful. I toweled off and cautiously stuck my head out of the bathroom. No masked intruder to my left. No masked intruder to my right. Then I looked down. And saw the perpetrator. My poor sad Roomba that ran out of battery life directly in front of the bathroom door and had been desperately seeking my attention. Or had simply been trying unsuccessfully to vacuum the bathroom because I don’t know how to work those little sensor things that you are supposed to put around your house and generally just turn it on, close some doors and hope for the best. OR the robots really are taking over and I caught the very first one in the act, thwarting their evil plot. YOU’RE WELCOME, HUMAN RACE! In any case. The murderer was the Roomba. The Roomba was the murderer. And now I’ll never look at it the same. That, my friends, is marriage. This is perfection! Loved it!! I’m sorry for the trust issues that have since developed. I hope the two of you can settle your differences and are able to cohabitate peacefully once more. 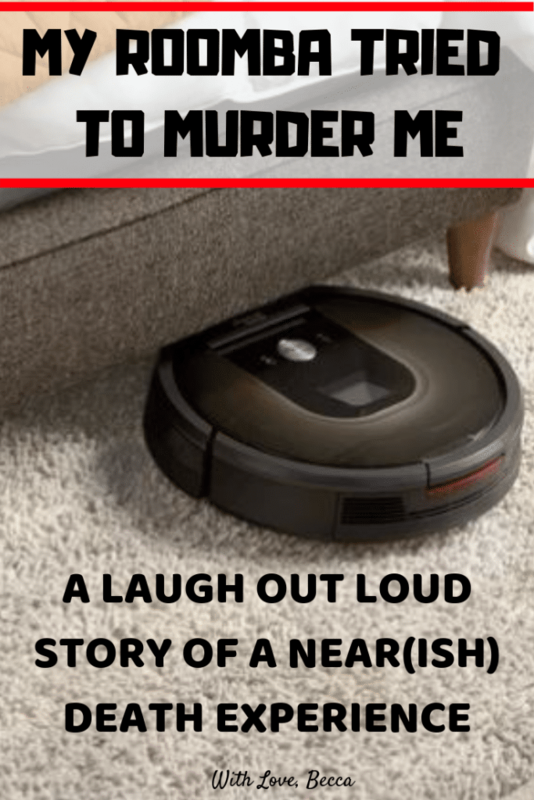 My favorite part is the ‘shop related murderers’ with amazon links for roombas! 😝 congratulations on proving the husband wrong! 😂😂😂😂😂😂😂😂 Hilarious. And yes, ‘Shop Related Murderers’ is perfection. Hahaha! Totally showing this comment to Glen!